We book birthday parties as early as 3 months in advance. If you have a special party in mind, it is better to book early! 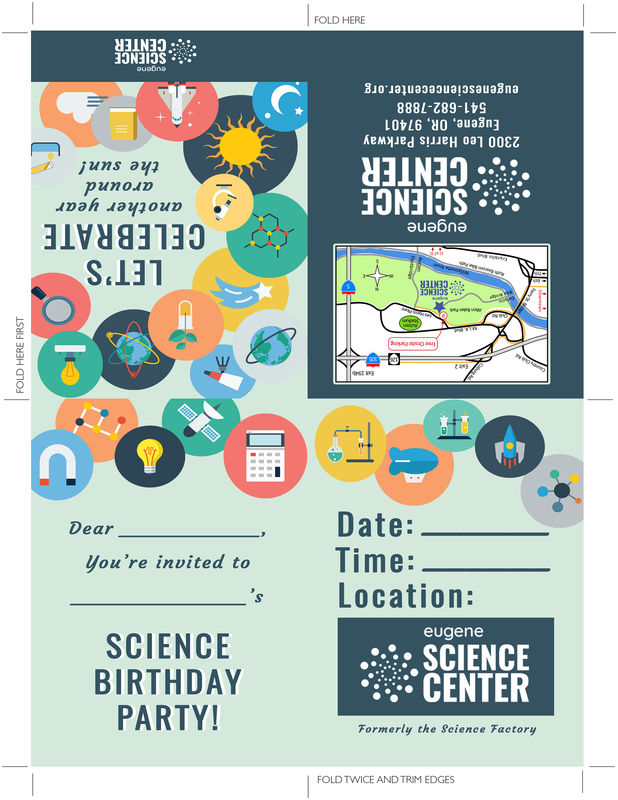 Print your own Science Birthday Party Invitations, or purchase a set of 16 color printed invitations for $5. Two hour party rental of our Birthday Room. Museum Exhibit Hall admission for up to 10 kids. Thirty minute science activity hosted by a Science Center Educator. Choose from one of our many themed activities, described below. Additional children beyond 10 who attend the birthday are $5.00 each. Hosted activities are designed for a maximum of 16 participating kids. If more than 16 kids are participating, the educator may choose to modify the activity for a larger group. Additional adults or others beyond the 20-person cap will pay regular Exhibit Hall admission ($5). Two hour party rental of our Community Room. Museum Exhibit Hall admission for up to 20 people total. Additional adults or children will pay regular Exhibit Hall admission ($5). Join a public showing of a planetarium show for $3 per person. Parties attending planetarium shows must have at least 1 adult for every 5 children. Click here to see the current planetarium offerings. Our birthday party room accommodates a maximum of 24 people according to fire code. Guests are expected to adhere to this limit; guidelines will be given at the time of registration. For parties expecting more than 30 people total, we strongly encourage you to consider an after-hours rental of the museum. 3, 2, 1 …. BLAST OFF! Guests construct and launch a rocket of your choice: simple paper tube rockets, or larger rockets with a soda bottle base. Using just the power of air pressure, you’ll be amazed at just how high they go! This activity takes place outdoors; please select one of our other parties as an alternative in case of inclement weather. DNA is the code in every living cell that leads to life as we know it. In this party, you’ll attempt to extract DNA from fruits, vegetables, or even your own cells! Guests will get their very own sample of DNA to take home. Have some soapy science fun with our Bubbles Galore party! 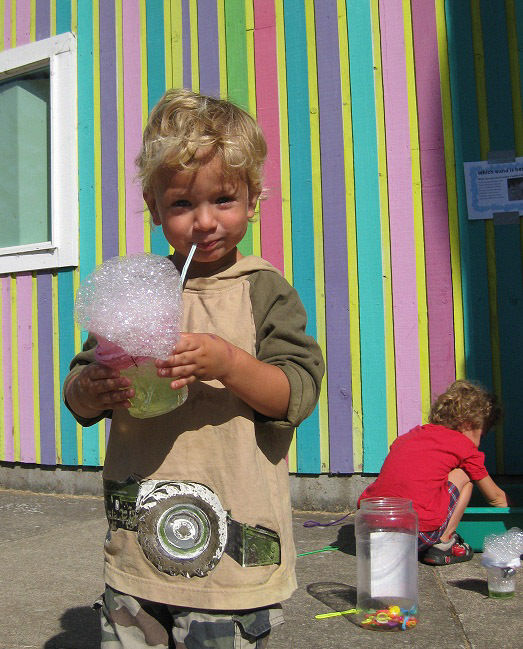 Choose from a variety of bubble activities, including bubble art, soapy snakes, and geometric bubbles. Every Bubbles Galore party ends with a demonstration of super-cool, super-spooky dry ice smoke bubbles! This party can get messy! There is color in everything around us. But what makes up those colors? Learn how to use just three primary colors to make every color in the rainbow! Make a mesmerizing toy top as well as a piece of tie-dye art to take home. Fizz, bubble, ooze, or pop? Select from an array of amazing mind-boggling experiments that explore physics and chemistry concepts. Create instant polymer worms, glowing slime, soda-pop geysers, elephant toothpaste, and more. Fasten your seatbelts and get ready for takeoff! Guests learn about the forces of flight and build their very own flying contraptions to test in our vertical wind tunnel. Best for ages 5 and older. Calling all space fans! 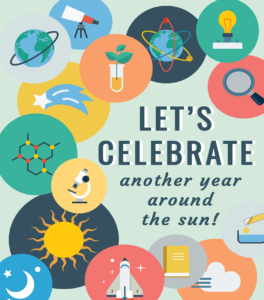 This party’s mission is to explore our universe by allowing you to choose three space related activities which range from discovering how orbiting works to creating a pocket solar system guide. You also have the opportunity to add a public planetarium show at a discounted rate for your friends and family to explore what is in our night sky together. Did you know the Eugene Science Center has a resident ball python, rose haired tarantula, bearded dragon? You can choose two of these critters to meet! This party includes an experiment to discover how venom affects the body. Please note, animals may not be available on the day of the party because of their care schedule. Please select a second choice for a party option just in case. The Birthday Host will let you know promptly upon arrival if any critter is not available.